I normally only write about my own food (of food those near to me have cooked) but today I'm going to male an exception. This weekend I've come away for my mum's birthday. Family holidays are few and far between now we have grown up and moved away so we thought we would take the opportunity of her birthday coming up to all go away together. 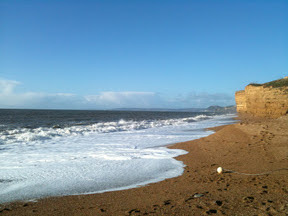 On the way to Devon, our final destination, we stopped at The Hive Beach Bar, Chesil Bank for breakfast. Now I've head a lot about The Hive over the years but have never actually been myself. 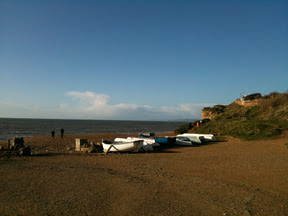 The Hive has won loads of awards and although it's a little more than a glorified beach hut it's easy to see why. For a start it has fabulous views. It has very friendly staff, a counter of very fresh looking fish and seafood and a counter (don't worry a different one!) of big homemade looking cakes. If the breakfast is anything to go on it also seems to have fabulous food. I had the Egg Benedict, which was slightly untraditional in that it had crispy streaky bacon instead of ham and the addition of a grilled tomato on the side. 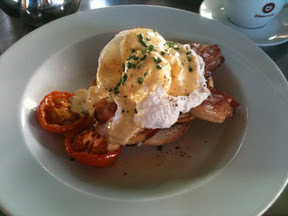 I wasn't sure about the bacon when I placed my order but it really worked with the eggs and the hollandaise sauce. I guess maybe because it is saltier than ham. I was less convinced about the tomato as the juiciness of it, at least in my mine, didn't really go with the rich hollandaise. Having said that it was a really tasty tomato so no complains, I just ate it first! The eggs were massive, perfectly cooked and very tasty and the hollandaise sauce was just delicious. 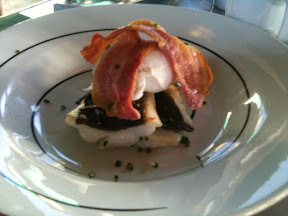 My dad had brill topped with a poached duck egg and bacon. Whilst I wouldn't be sure about eating fish for breakfast it did look very good. The others had bacon sandwiches with a side of black pudding which also looked really good. Overall I think this place would be worth travelling for. I'm thinking perhaps a holiday nearby so I can now try out lunch, dinner and afternoon tea!